Music has always played an important role here at Trinity and we partner with many outstanding musicians and musical groups. 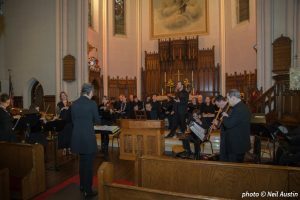 Our Choir is comprised of music professionals who have sung with the Metropolitan Opera Company, Richmond County Choral Society and the Wagner College Choir as well as folks who just love to sing. Many of our members also teach at Wagner College and other neighborhood schools. We also enjoy a Bell Choir that graces our services throughout the year. Other members in our congregation are music professionals and young musicians who add their gifts to our worship services. Supporting our love of music, we are fortunate to have a 36 rank Casavant organ. Under the leadership of our organist and Director of Music, Mark Rossnagel, we continue the tradition of bringing beautiful music to our space. Mark, originally of Staten Island, holds a Bachelor’s Degree in Organ Performance from Binghamton University, where he studied with the late Jonathan Biggers, and a Master’s in Piano Performance from the University of Southern Maine, where he studied with Laura Kargul. In addition to his work as a keyboardist, he has sung in and conducted numerous choirs, and participated in a two week seminar on choral conducting at the Eastman School of Music, where he worked with William Weinert and Kent Tritle.Mark loves creating great music within the space of worship and is grateful for the opportunity to do so at Trinity Lutheran. He is always looking for interested singers, instrumentalists and bell-ringers, so please get in touch with him if you would like to participate in our Music Ministry. Wagner College and Trinity’s history go hand in hand. The New York Ministerium, recognized the need to find a new home for Wagner, and placed the Reverend Frederic Sutter, one of Wagner’s first graduates, in charge of the relocation. Pastor Sutter, a lifelong supporter of Wagner College, had established his own ministry on Staten Island in 1907 (Trinity Lutheran). Through Sutter’s efforts, Wagner College relocated to Grymes Hill on Staten Island in 1918. Is a new baroque vocal chamber music collective and is members are the Artists in Residence at Trinity. They believe baroque vocal chamber music makes for a unique musical experience because of its singular,intimate beauty. Staten Island artists and/or emerging artists are featured in each concert, because fostering both local and young talent is essential to the community and to the art form. Access is provided for as many people as possible: nursery services provided FREE for 5 and under, concerts about an hour, early start times, handicap access always, senior and student discounts, and kids 18 and under get in FREE.